While planning for our trip to Toronto, I read lots of travel articles and watched as many shows on the city as I could find. I wanted to find the best things to do in Toronto, knowing that we had a limited time. Most stories I read discussed Toronto’s ethnic diversity, fantastic food, art attractions, fashion scene, or its entertainment offerings. I was left wondering what my prospects were to find cool historical places to explore. 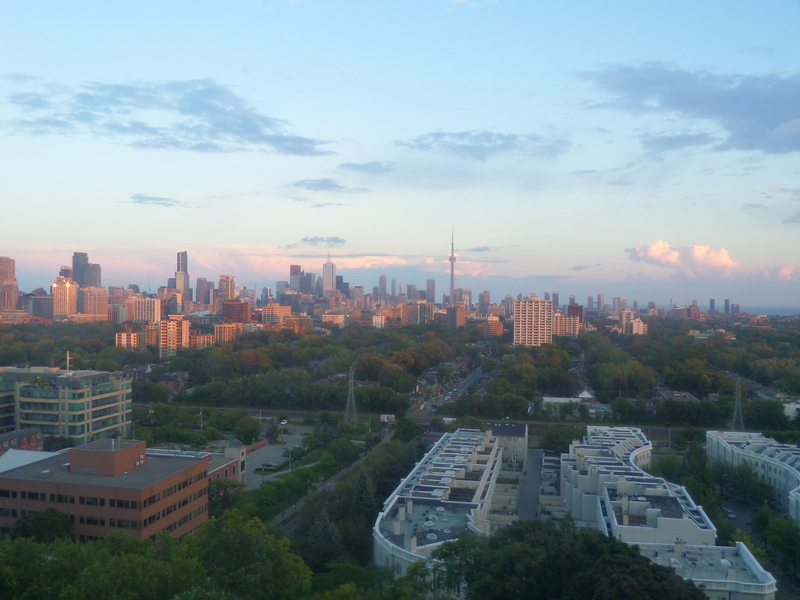 Having returned from 45 awesome hours in this city, I can assure my readers that Toronto has all of the aforementioned attributes plus many sites that pay homage to its rich heritage. We decided to take a short road trip from Michigan to Toronto, Ontario. Driving on a two-lane highway through pastoral countryside, I was struck by this province’s ties to its British past. Roadside markers in the shape of a crown reminded me that Canada is a constitutional monarchy. Towns with decidedly Anglo names—Warwick, Stratford, London, Middlesex—reinforced Ontario’s pride in its heritage. As we neared Toronto, the number of lanes on the highway grew, as did my excitement. We rounded a bend and the city unfolded before us with its iconic CN Tower and skyscrapers. We only had 45 hours in this expansive, great city. My mission, if I chose to accept it, was to identify historical sites and experiences sure to tantalize travelers who are looking for what to do in Toronto. Mission accomplished! I enjoyed as many of the city’s cultural gifts as time allowed, and had a splendid time doing so. Now I’m excited to share them with you. Upon hearing of our trip to the city, the fine ladies and lords at Medieval Times reached out to us to be their guests for dinner and a show. My husband and I had never been to one of these events so we were quite excited. As we neared the venue, I saw an ornate Renaissance-looking building across the street that tickled my fancy. Seeing the elaborate facade of this former government building was a good omen that Toronto would have similar historical charms spread throughout. Having whetted my historical appetite, I was ready to transport back to the medieval era and enjoy the pageantry of royal court games of skill. Enthusiastic patrons clamored to see the “royal” family and visit the animals to be used in the show. The doors to the arena opened and servers ushered us to seats surrounding the oval track. Each color-coded section was set so all guests would have a good view of the action. Colorful banners allowed us to cheer on our corresponding knight. Ours was the yellow knight—who won! We enjoyed a four-course meal eaten with only our hands. I’m not sure what I enjoyed more—watching the jousting and combat games or looking at the pure joy on children’s faces as a falcon flew around, the royal court paraded by on grand horses, and knights clinked battle axes. The best part was watching the winning knight crown a little girl as a princess. Her glee and jubilation lit up the rom. It was wonderful to see so many people enjoying historical reenactment. When the show ended after an action-packed two hours, it was time to check into our downtown Toronto hotel. After dropping our bags off and freshening up, we went to the St. Lawrence Market. The site has held a market since 1803; it also served as a meeting place for abolitionists. The location of Toronto’s first city hall, it housed the city’s prisoners in the basement. The present red-brick building (1850) hosts over 100 artisans, butchers, grocers, bakers, fish mongers, and restaurateurs. 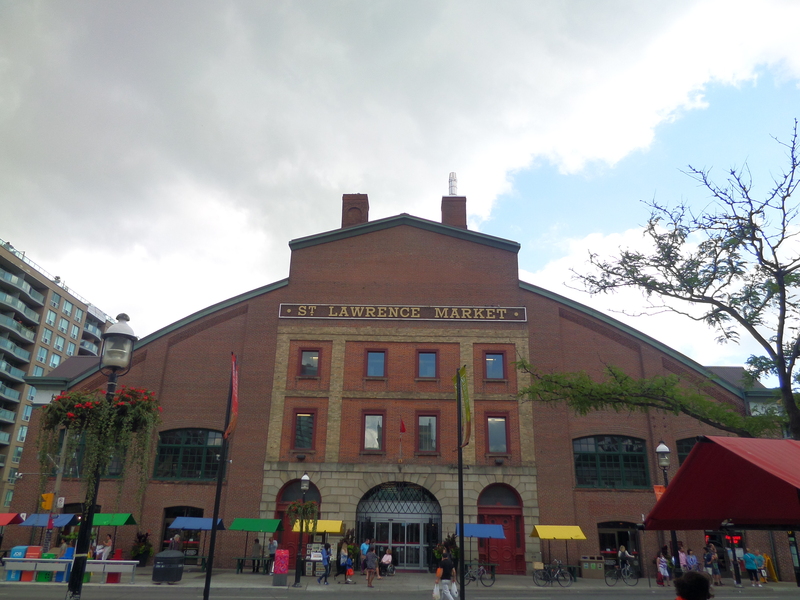 Its rich history (exhibits on second floor) and tasty treats makes St. Lawrence Market a delight. We had planned for a personal tour of Old Town at 5:00. Our guide, Jane Herman of On the Town, started our adventure at the market. I was immediately impressed when she asked questions about our pre-existing knowledge; it showed me that she cares about providing tours tailored to her guest’s needs. Her personal attention and knowledge of the city’s history is her hallmark. I enjoyed seeing the city through her eyes as her passion for it is obvious…and contagious! After exploring St. Lawrence Market, including peeking at special areas, we walked by former warehouses to the Gooderham Flatiron Building (1892). This Romanesque-revival building is shaped like a triangle (an underground passageway allowed Mr. Gooderham to access his money at the bank across the street). Jane led us by the magnificent Gothic-revival St. James Anglican Church (current building 1853), a former courthouse, the Bank of Upper Canada (1827), the De Salle Institute (1871), and the First Post Office (1833). With Jane telling us tantalizing tales about all these sites, I didn’t think it could get better, but it did. She took us to Corktown (a former Irish enclave), where Anglicans who couldn’t afford the pew rent at St. James founded Little Trinity Church (1843). Around the corner was the Enoch Turner Schoolhouse (1849) where poor, immigrant children gained an education. Nearby is the delightful Distillery District. A well-preserved collection of Victorian industrial buildings (1859 on), I loved walking the brick lanes by places where whiskey was made and distributed (until Prohibition in 1916). Red brick buildings with green trim provide a beautiful exterior for the cafes, boutiques, and galleries within. White lights strung between the buildings twinkled in the early evening light. It was a perfect place to end our tour, although I didn’t want to end. I could never have gotten so much out of this area if it wasn’t for our tour with the knowledgeable and engaging Jane. 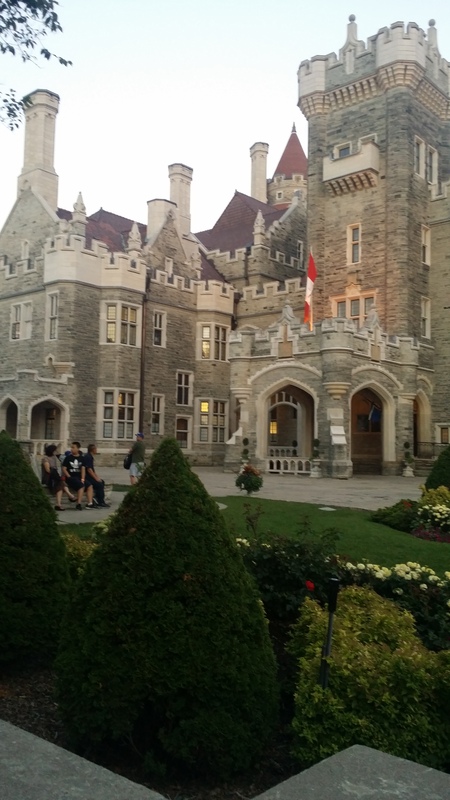 Although we had already had a full day of sightseeing and travel, to my husband’s chagrin I suggested that we check out Casa Loma (1914), which was open late that day. Although he moaned (and made me feed him first), his mood changed when he saw the majestic castle on the hill. Sir Henry Pellatt’s former home is 200,000 square feet of stunning architecture and décor. From the stately library to the elegant dining room, opulence is seen throughout. We had picked a great time, as the crowds were few. I could roam throughout imagining it was my own estate. I would happily settle for just a tenth of it though. 🙂 It was fun climbing the tower’s winding staircase and taking secret passages from floor to floor. A tunnel led us to stables, a garage, and a potting shed. The castle’s terrace (and tower) provide a great view of the city. Watching the sun set from the terrace while listening to a symphony play in the garden was a luxurious ending to our first day. We started our day walking around downtown where we stumbled across a grand-looking building. The former Bank of Montreal (1886) is now the Hockey Hall of Fame. Since it had just opened, we had the place virtually to ourselves. We raced past hockey artifacts from around the world (stopping to look at the Detroit Red Wings cases) to get to the Stanley Cup. The room housing the cup was the former bank lobby; its stained-glass dome, coffered ceilings, murals, arched windows, and gilded friezes indicated that this was a place of importance—once for money and now for sport. I was impressed by how some of the bank’s original features were preserved like the vaults, which now hold another treasure—the original Stanley Cup. Leaving the reverential trophy room, I had a blast playing goalie in a model rink with virtual players shooting real pucks at me. I blocked 75% of the shots. Not bad for a roaming historian! Having worked up a hunger from all that goal tending, we strolled over to the world-famous Carousel Bakery in St. Lawrence Market, which is renowned for their delicious eats, especially the Peameal Bacon sandwich. Co-owner Robert Biancolin told us the tale of how the quintessentially Torontonian sandwich came to be. Englishman William Davies created it using lean back bacon rolled in cornmeal. In the late 1800s, Davies became the largest pork packer in the British Empire earning Toronto the nickname “Hogtown.” After hearing its history, I could wait no longer to taste this famed sandwich. Served on a soft roll, the pork was very tender with succulent juices dripping out. To be proper, I did not lick them off the wrapper upon which they fell…but I wanted to. After tasting it in its purest form, I added their special mustard made with maple syrup and horseradish that added an element of sweetness and tang enhancing the juicy bacon. I can see why star chefs around the world stop here! Robert finished our meal with a sweet butter tart that was rich yet delicate. 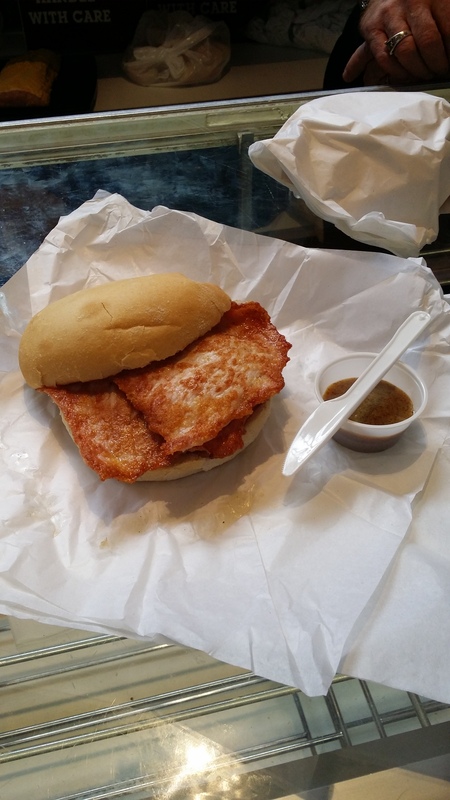 I would drive the 4 1/2 hours to Toronto just to stop at Carousel Bakery and have a Peameal Bacon sandwich. Toronto’s architects do a great job of preserving historical elements of buildings while making them 21st century functional. Steam Whistle Brewing is a great example. Located in a former train repair station (1929) called the Roundhouse, this brewery serves one type of beer, a pilsner. We toured the facility with Rylan, a funny and interesting guide. It was neat to see the production process, but I really enjoyed hearing the company’s pro-labor philosophy. A whistle blows at 5 every day to remind workers to go home and relax. The beer is made with only 4 all-natural ingredients and they take great care to lower their environmental impact. The deck out back allows patrons to sip a brew while taking in the view of old rail cars on this historic site. 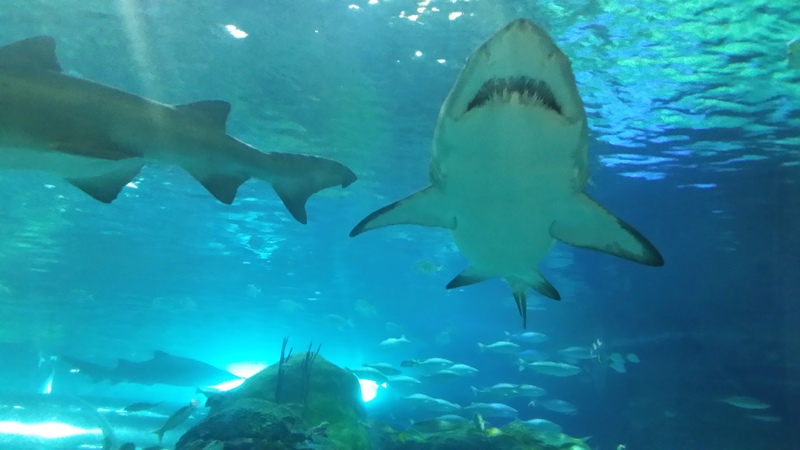 Next door is Ripley’s Aquarium, where we delighted in seeing lots of marine life. The sharks were a huge attraction, but the playful rays thrilled me, too. We went in the afternoon and the lines were quite long. It might be a better bet to go in the evening. Leaving the “Dangerous Lagoon” behind, I started to regret not allocating more time for our visit. There are so many sights to see: Fort York, Spadina House, the Royal Ontario Museum, and much more. We chose to visit Mackenzie House and were not disappointed. The home of William Mackenzie—Toronto’s first mayor, radical political journalist, newspaper printer, and leader of the 1837 Upper Canada Rebellion—is a modest Greek-Revival row house. Docents dressed as 19th century printers took us through Mackenzie’s life and times. Touring the house, our guide demonstrated everyday tasks and told interesting stories about the home’s inhabitants. Another docent took us into the recreated 1850s print shop where we learned about Mackenzie’s radical politics and showed how the machines operated. I highly recommend stopping by when in town. We were growing hungry again, so we went to Terroni—an Italian restaurant housed in the former courthouse (1853) that Jane had shown us on the tour. After a lovely dish of pappardelle pasta, an employee took me on a tour of the building showing me the basement jail cells (now storage),the second-floor courtroom, and the public square out back where hangings occurred. We walked off some of the calories by going down to the harbor where ferries take people over to Toronto’s islands. We were too tired, but if you have a little pep in your step you might want to consider having a drink in one of Toronto’s diverse ethnic neighborhoods. Needing to leave by 10 a.m., we didn’t have a lot of time, but found it was the perfect time to visit the CN Tower. We were able to jump on the elevator and make the 58-second journey to the observation deck (1136 feet high) without waiting. The view was breathtaking! I said farewell to Toronto on a high—literally. Toronto is a study in old meets new. Tall skyscrapers punctuate the skyline, while historical buildings meet the standing eye. It’s a vibrant, bustling town with something for everyone and I can’t wait to go back. Next time, I might leave myself more than 45 hours! Disclosure: I was the guest of Medieval Times, On the Town, Carousel Bakery, Steamwhistle Brewery, and the Toronto Tourism Board, but all opinions and views expressed in this article are my own. Additionally, I chose what places to visit and to highlight in my writing. Nice post. The diversity of restaurants was definitely a highlight when I was there — some of the best Thai and Moroccan food I’ve ever had! I love cities where there are so many food choices.